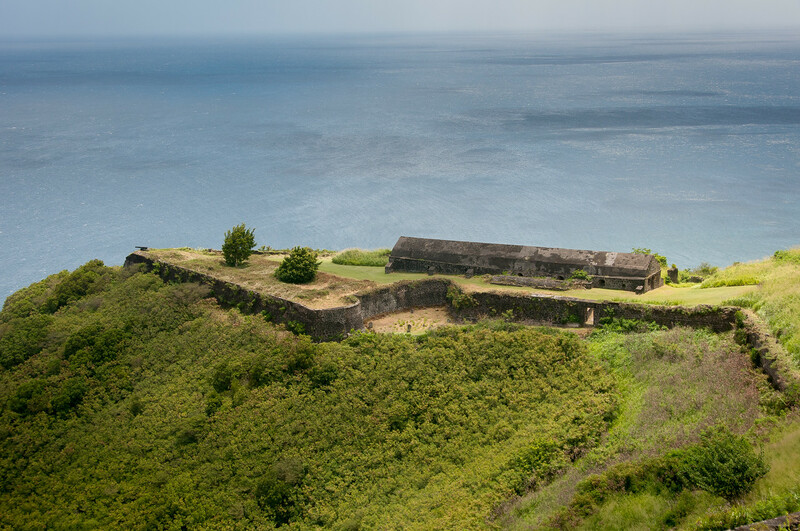 The Brimstone Hill Fortress is of historical, cultural and architectural significance, a monument to the ingenuity of the British military engineers who designed it and supervised its construction and to the skill, strength and endurance of the African slaves who built and maintained it. In some of its architectural features, notably the Citadel, are expressed elements of different stages of fortress design; ?it is an embodiment of European imperialism, and the emergence of a distinctive Caribbean culture. It is indicative of the competition for power and wealth at a crucial stage in world history, and it provides a medium by and through which the geology, ecology and history of the Caribbean can be understood. As managed by a competent local organization on behalf of the people of a young nation, the majority of whose citizens are descended from former slaves, it is a symbol of a colonized African people and of the integrity of Caribbean culture, and as such it can be an inspiration to other young nations in a post-colonial era. Known as Liamuiga (Fertile Island) to the native Amerindians, Saint Kitts was the first Caribbean island to be permanently settled by both the English (in 1623) and the French (1625), who shared it between 1627 and 1713, when it came under sole English control through the Treaty of Utrecht. Known as the ‘Mother Island’, it provided the model and springboard for English and French colonization in the Caribbean. African slaves were brought in from the earliest years of European settlement, and it was on Saint Kitts and the other early colonies that the plantation system, based on sugar production and slavery, had its roots. Because of its reconstructed and very formidable defenses, Saint Kitts became known as the ‘Gibraltar of the Caribbean’. It successfully drove off an attack by the French Navy in 1806. From that time onwards the British Navy was able to ensure the security of its island colonies in the Caribbean. The fortress was abandoned as a result of British defense cuts in 1853. The wooden buildings were auctioned and dismantled and masonry buildings were plundered for their cut stone; natural vegetation progressively took over. 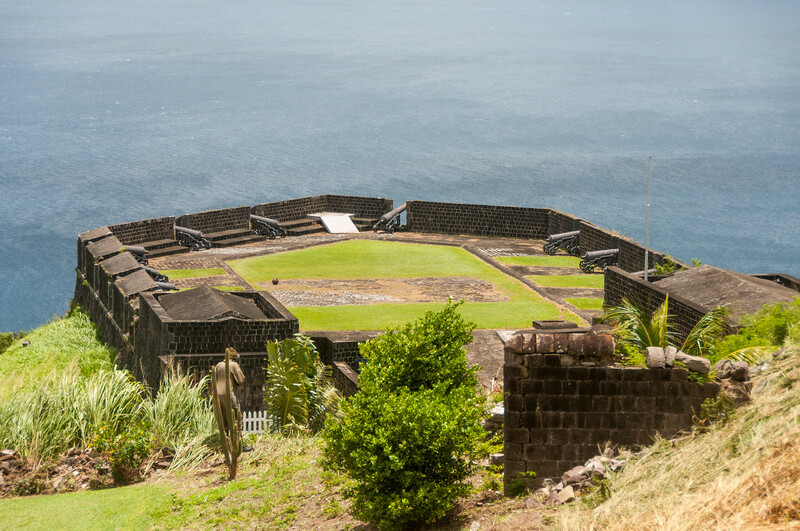 The Brimstone Hill Fortress is the only world heritage site in the Leeward Islands of the Caribbean. The island of St. Kitt’s (aka St. Christopher) was the home of the first English and first French colony in the Caribbean. Few original wooden buildings in the Caribbean remain. The stone structures of fortresses and some warehouses are all that remain of the former colonial past. The fortress is far and away the best preserved historical site I’ve seen in the Lesser Antille, with only St. Eustatius coming close (and they should probably be a world heritage site also). If you visit St. Kitts, the fortress will undoubtedly be on any tour you take as it is the touristic and historic highlight of the island. 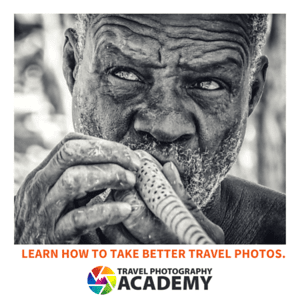 If you are visiting from a hotel or resort, look into taking an organized day trip instead of renting a car. Gas on the island is very expensive and there is a $25 temporary drivers license that they charge on top of any car rental, which makes anything less than $75/day for a car impossible. You can easily book a day trip for half that amount that will visit the fortress. 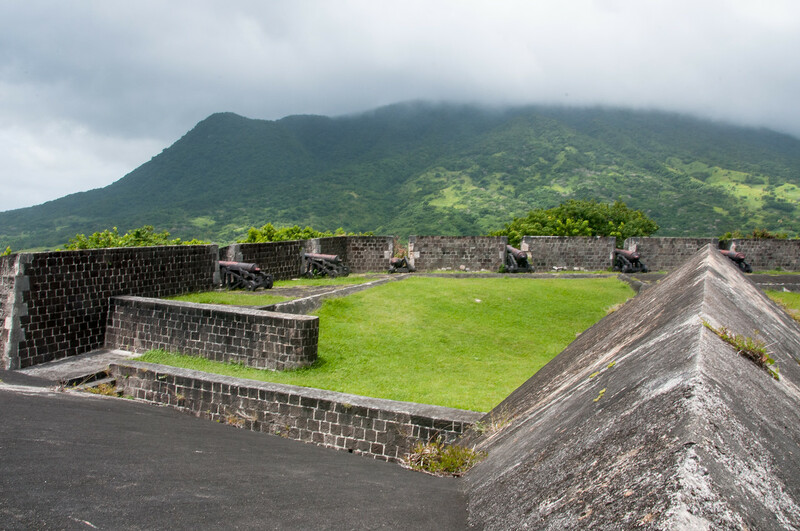 Brimstone Hill Fortress National Park is a cultural UNESCO World Heritage Site in Saint Kitts. It was inscribed in 1999 and is a well-preserved fortress located atop a hill in the island of St. Kitts. The national park itself was established in 1987. The fortress was designed by British military engineers but it was built and maintained by the African slaves. 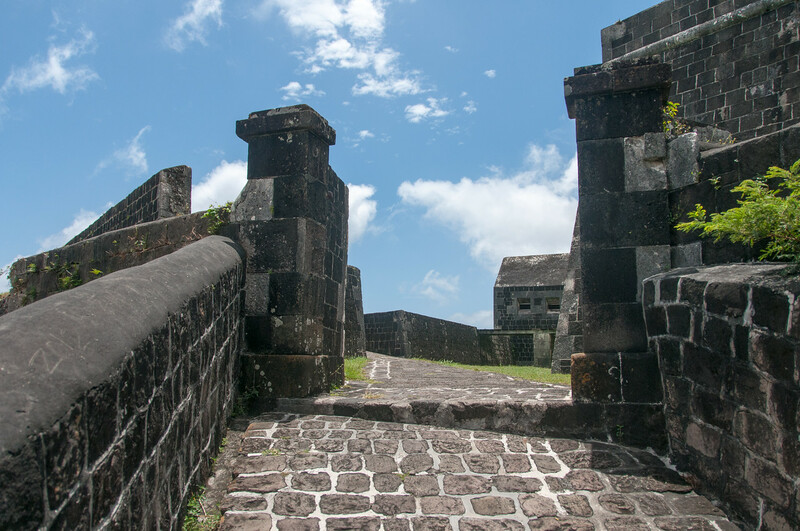 Aside from the cultural significance of the Brimstone Hill Fortress National Park, it is one of the best preserved historical forts in the Americas. The park is named after the Brimstone Hill, to which the fort is built on. Even though Brimstone Hill Fortress National Park is a cultural site, it is also known for its historical and architectural value. During its heyday, the Brimstone Hill was called “the Gibraltar of the West Indies” due to its imposing height. During the late 18th century, a siege was held by the French troops at the fort. This siege prompted the nearby island of Nevis to surrender. 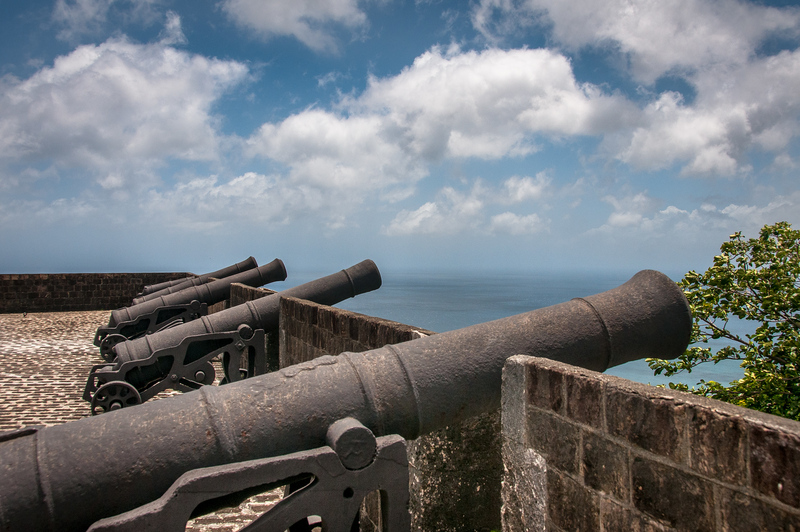 Hence, all of the guns and supplies were brought to St. Kitts to be used against Brimstone Hill. After a month of siege, the British garrison was forced to surrender too. The Treaty of Paris was enacted a year later that returned control of Brimstone Hill and the St. Kitts island back to British rule. Due to the siege, the British decided to augment the fort to do a better job at protecting the island from invaders. The island is settled by the French and English, which became the ticket to colonialism in the Caribbean Islands. This made the wealth of the Caribbean Islands more prominent during this era, which also made it worth defending. The Brimstone Hill Fortress National Park is a park established around the Brimstone Hill Fortress. It is also notable for its use of the “polygonal system”, which is a unique style of fortification. The hill is 800 feet with steep slopes. Meanwhile, the wall of the fortress is made mostly out of stone that are fashioned from hard volcanic rock. There are several components to the Brimstone Hill Fortress National Park. Each of these structures forms a significant portion of the entire complex. The first of them is the Prince of Wales Bastion, which is where the Main Guard Barracks, Brigade Office, and the Powder Magazine is located. Today, it is open to be used as a social facility such as public functions and weddings. Another important feature in the ruin is the Barrier Redan. This is where four cannons are mounted to protect the road and nearby structures. There are other notable features within the Brimstone Hill Fortress National Park. These features include the Artillery Officers’ Barracks, Visitor Center, Fort Charlotte, and the Citadel. The Citadel is the most important feature and is where you will find the Fort George Museum. View the complete list of UNESCO World Heritage Sites in St. Kitts.